The names of people of Eastleigh, who were killed during the First and Second World Wars, have been engraved on a new addition to the war memorial in the centre of the town. It will be the focus of the Remembrance Sunday wreath-laying ceremony on 11 November – the 100th anniversary of Armistice Day. The new monument, an addition to the existing war memorial in the Leigh Road Recreation Ground, will honour people from Eastleigh parish who were killed in the two conflicts. 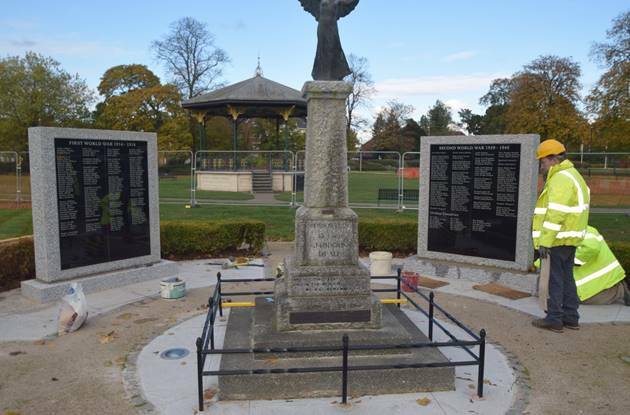 Last year, Councillors on the Borough Council’s Eastleigh Local Area Committee, agreed £35,000 funding for major works to improve the memorial in time for the centennial commemoration, as well as create better access and surroundings for the many who attend the annual ceremony. Since then, the Council has been working with the Royal British Legion to create the monument that bears the names, engraved on a pair of granite monoliths, that are taking their place alongside the distinctive figure of the Angel of Mons, as work nears completion. This year’s Eastleigh Remembrance Service begins with the civic procession led by the Mayor, Councillor Bruce Tennent, from The Point arts centre in Leigh Road before the wreath-laying ceremony and two minutes silence (at 11am).